At its best, the recent 28th Constitutional Convention of the Canadian Labour Congress demonstrated how far unions have come on Indigenous rights, Palestinian rights (more on that later), racism, queer or trans rights, mental health, and environmental justice. Delegates made passionate appeals to support these and other important struggles. Impressive speakers like Angela Davis, Candy Palmater, Cindy Blackstock and Mary Walsh argued unions must champion issues suppressed by powerful insiders. Heartfelt videos acknowledged former CLC President Bob White, outgoing Secretary-Treasurer Barb Byers, the 25-year anniversary of the 1992 Westray Mine disaster, and the ongoing crisis of missing and murdered Indigenous women and girls. On the fourth day of CLC Convention, a union “street party” occupied Bay and King Streets, the heart of Canada’s financial district. At its worst, the 28th CLC Convention also illustrated the limited thinking that exists in union circles, particularly at the leadership level. Election leaflets festooned the halls making few, if any, specific promises. A 5 per cent pay increase (indexed to inflation) was approved for CLC leaders who currently earn over three times the average wage in Canada, despite stiff opposition from convention delegates. UNIFOR (the largest private sector union) and Local 113 of the Amalgamated Transit Union continued their public feud after an attempted raid by UNIFOR failed earlier this year. Premier Rachel Notley arrived to celebrate achievements made by the NDP government in Alberta, but ended with a pitch for export-driven oil pipelines, the impact of which would undermine current efforts in Canada to meet global climate change targets. At a time when organized labour faces existential challenges, these optics at union conventions leave many cold. Before going to the 28th CLC Convention, I canvassed my Facebook contacts to see who else was attending, and this reply earned the most praise: “I’ll be raking leaves in my yard during CLC Convention, which is likely to add more to the class struggle.” Ouch. While such cynicism is understandable, I’ll offer another perspective here. Yes, union conventions are spaces where top-down strategies get used for particular outcomes, but they are also moments where activists can shift beyond optics to politics. With the right strategy, activists can organize, appeal for support, and advance important work. Two examples from the 28th CLC Convention help illustrate this point. The first was an emergency resolution urging the CLC to support a hunger strike of 1500 Palestinian prisoners in Israel that started on April 17, 2017. At the CLC Convention, this resolution was promoted by a network of delegates and earned 15 endorsements, including the CLC’s Canadian Council (a decision-making body that meets daily at the CLC Convention, and four times a year). When the resolution hit convention floor, it was attacked by some as anti-semitism, and an unfair targeting of Israel. But after a spirited debate, the resolution passed. CLC President Hassan Yussuff’s ruling on this outcome was challenged from the floor, but the challenge was defeated. The work of climate justice campaigners is a major factor, along with the continued evidence of climate change. The climate drivers behind recent floods in Ontario and Quebec were on peoples’ minds, as were the deplorable conditions in many Indigenous communities impacted by fossil fuels projects. Delegates at the CLC Convention entered that context with grassroots organizing, and this contributed to a shift in opinions of Premier Notley’s plans for Alberta. Notley is now publicly campaigning to ensure the BC government doesn’t become a pipeline opponent. All of which is to say: union conventions matter, and how they are utilized by activists and movements matters. The unions our grandmothers and grandfathers built must not be left to those concerned only with optics, however sincere their intentions may be. Our unions need better politics, and activists prepared to fight for them. This article first appeared at this address. by Julius Arscott, OPSEU Executive Board Member, and organizer, Workers’ Action Movement. Missing at the CLC convention was a critical element: an organized class struggle left wing. Such a radical caucus could unite militant workers, speak to issues, try to amend resolutions, even run candidates on a socialist platform. Some small break-time meetings did occur. One was a forum hosted by Avi Lewis to discuss the pro-environmental, anti-capitalist LEAP Manifesto. 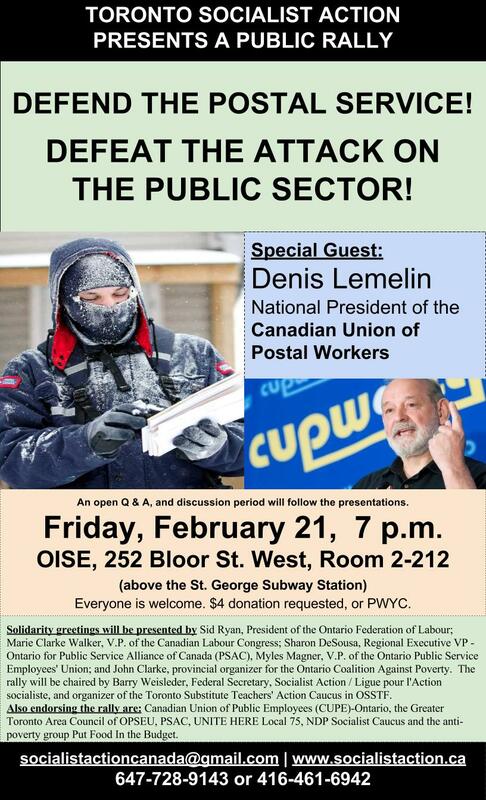 Another, organized by the Canadian Union of Postal Workers, discussed creating links between organized labour and community grassroots organizations — a theme addressed by the CLC bureaucracy the next day. Neither of these meetings, however, led to any effort to form an organized left wing in the labour movement to challenge the status quo. In fact, in the latter case, organizers asked that the actual convention proceedings not be discussed as it might upset some union officials. Needed now more than ever is an organized left wing, similar to initiatives on a modest scale in OSSTF and OPSEU, to oppose concessions bargaining and the austerity agenda of the Bay Street political parties, as well as to fight for democracy in our labour movement. Efforts by Socialist Action during the convention were well received by delegates who bought over 100 copies of SA newspaper and accepted many more Turn Left magazines. The SA booth in the Exhibitors’ area, alongside affiliated unions and labour allies, welcomed many visitors. If you are in the Montreal area on May 5, do you plan to attend this event? in Montreal, Monday, May 5, 2014. Hassan Husseini (invited), negotiator for PSAC, member of UNIFOR, and candidate for President of the Canadian Labour Congress. Donald Lafleur, 4th V.P. of CUPW, candidate for Vice-President of the CLC. Lindsay Hinshelwood is a member of UNIFOR, Local 707. She works at Ford in Oakville, Ontario, and was a candidate for UNIFOR President in 2013. Julius Arscott is President of Local 532, Ontario Public Service Employees’ Union, and an executive member of OPSEU Greater Toronto Area Council. Barry Weisleder, organizer, Toronto Substitute Teachers’ Action Caucus, Ontario Secondary School Teachers’ Federation; co-editor, Socialist Action newspaper. Chairperson: Elizabeth Byce, retired member, Toronto Local, Canadian Union of Postal Workers. Monday, May 5, 12:30 p.m.
in Room 515 AB, Palais des Congres, Montreal Convention Centre, 900-159, rue Saint-Antoine O., Montréal, Quebec.